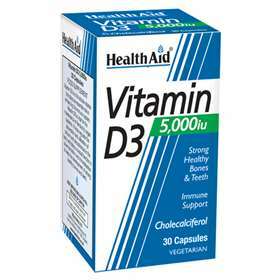 Health Aid Vitamin D3 plays an essential role in the immune system, maintenance of normal muscle function, helps to regulate the absorption and utilisation of calcium and phosphorous in the body which plays a crucial function in healthy bones and teeth. Vitamin D3 may also be beneficial to those who do not have enough exposure to sunlight, and elderly people who are prone to bone disorders. Helps the body absorb calcium to support strong bones and teeth. Adults one capsule daily or as directed by a suitably qualified person. Do not exceed the commended daily intake. Seek professional advice before using, if you are pregnant, breastfeeding, under medical supervision.